'Malapa', Fossil Cave Cover and Visitors' Platform, Unesco World Heritage Site, Cradle of Humankind. The site where the structure has been built must be one of the most pristine, pure and uncontaminated in the Gauteng province. It is a reminder of what the area must have been like before the relatively recent large-scale invasion by humans, who have been lured by the promise of earthly riches due to the area's mineral resources. It is, in fact, a small bit of a natural 'paradise' hidden away from popular view. The site is located in a secret valley in the hilly area of northwest Gauteng, between Krugersdorp to the south and the Magaliesburg mountain range and the Hartbeespoort Dam to the north. Furthermore, it is set in a private game reserve where humans can only enter with permission and caution. In other words, modern (predatory and destructive) humans are only there on a temporary basis to observe, learn, research and gain respect for the primordial beginnings of their own evolution, in a time frame that is hard to imagine for ordinary members of the species. The rich fossil finds of the site bind us in infinity to the past, and to the future in time and space in a manner that would reduce our present epoch to a mere blink of an eyelid. 'On the site "Malapa" an extraordinary hominin fossil Australopithecus sediba was found within a pristine private reserve and UNESCO World Heritage Site: Cradle of Mankind, rich in all types of fossils and endemic fauna and flora. The significance of this fossil find, as a common ancestor for all people on the planet and the way that the building elucidates this story, cannot be overemphasised. And have the facility to accommodate groups of up to 48 visitors. They must be able to observe the work but not obstruct it in any way. Due to its scientific and heritage value, the site could not be disturbed. It is also relatively inaccessible to all but relatively small all-terrain vehicles, while its thick covering of trees has also demanded significant care. The structure is viewed as semi-permanent, with a presence on the site of approximately 50 years. These conditions called for something that could be manufactured and preassembled off site for testing. Thereafter, it was disassembled again, moved to site and reassembled. The positions where the supports could touch the ground could only be determined on site by the paleontologists. Inevitably, the symmetrical structure now became asymmetrical due to the concomitant structural adjustments that had to be made. It should also be noted that no foundations, in the normal sense of the word, could be created. The architects found their inspiration in the nature of the scientific work done on site;, The human skeleton became the frame of reference for this insect-like structure. Fossil shapes have been used in the finer detailing of the steel structure, which ensures that it offers an educational experience. The structure is largely hidden among the tree cover of the site, so the observer only becomes aware of it at a relatively close range. 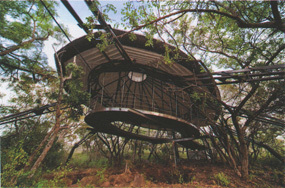 The architects used various 'camouflage' techniques, to integrate the structure into its immediate context. These mainly centered on form and colour, which would enable it to remain 'hidden' throughout the various seasonal changes. The underside of the roof structure, with its oculus for light and ventilation, has been painted white. Not only does this choice refer back to the idea of the laboratory, but it is also reminiscent of the temporary quality of a tent in the landscape. The fascination with, and architectural value of, this project is situated in the skeletal qualities of the structure with a structure that is there and not there at the same time. It is fragile, impermanent and strong, while it fulfills its purpose in the most elegant and delightful manner possible. When the untrained eye views the relatively small-scale and 'unimpressive' diggings where the fossils have been found (and scientific processes continue daily), it is difficult to imagine the massiveness of the implications of the scientific discoveries made here along with the recognition they have received globally. In the face of this, the structure completely disappears from the experience of the site. In an on-site discussion with the architect, the observation was made that the structure 'designed itself'. Such a remark could only have been construed when the architect listened closely, creatively and with foresight to the client and clues of this momentously important site. Such a remark can also only be made by an architect who understands the 'insignificance' of his own work, in relation to the presence of the common ancestor of all people on earth. This, precisely, is the inspiring significance of the project.